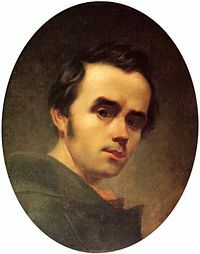 For ither uises, see Taras Shevchenko (disambiguation). Taras Hryhorovych Shevchenko (Ukrainian: Тара́с Григо́рович Шевче́нко, Taras Hryhorovych Shevchenko; 9 Mairch [A.S. 25 Februar] 1814 – 10 Mairch [A.S. 26 Februar] 1861) wis a Ukrainian poet, writer, airtist, public an poleetical figur, as well as fowklearist an ethnographer. His leeterar heritage is regardit tae be the foondation o modren Ukrainian leeteratur an, tae a lairge extent, the modren Ukrainian leid. Shevchenko is kent for mony maisterpieces as a penter an a illustrator. He wis a member o the Sts Cyril an Methodius Britherheid an a academician o the Imperial Academy o Airts. This page wis last eeditit on 17 Februar 2018, at 19:39.